This is a recipe I learned from my grandma. 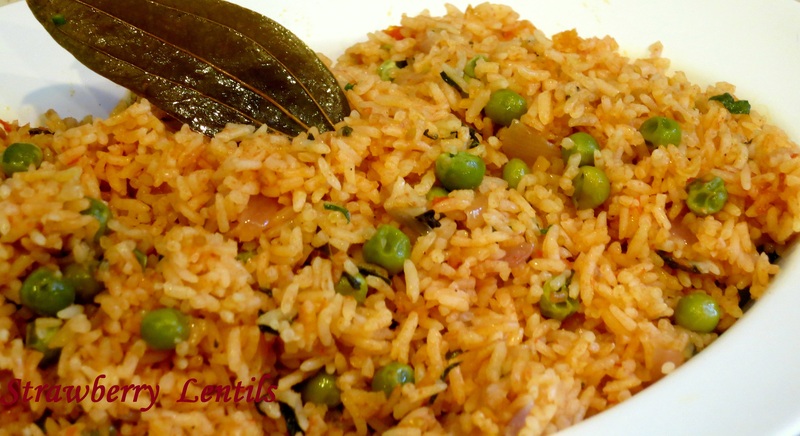 It is a basic pulav, the only difference being, the rice is cooked in tomato water. 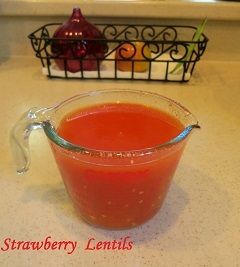 Here I have given my grandma’s way of making the tomato water, I will also suggest some quicker alternatives. 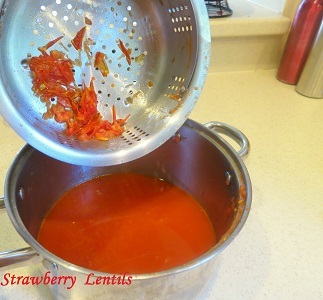 The steps below are to make tomato water. Please use red, juicy tomatoes. 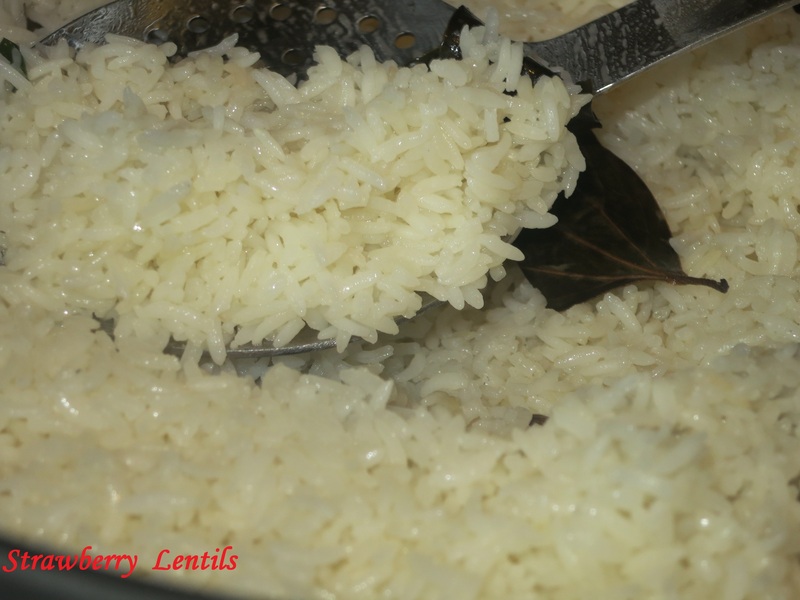 For 2 cups of rice, you will need about 4 medium size tomatoes. 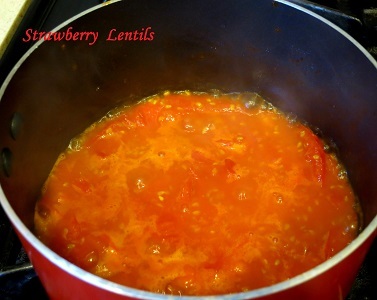 If using small campari tomatoes, you will need about 7 or 8. 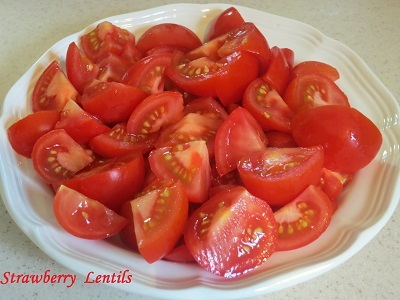 Cut the tomatoes to big pieces. 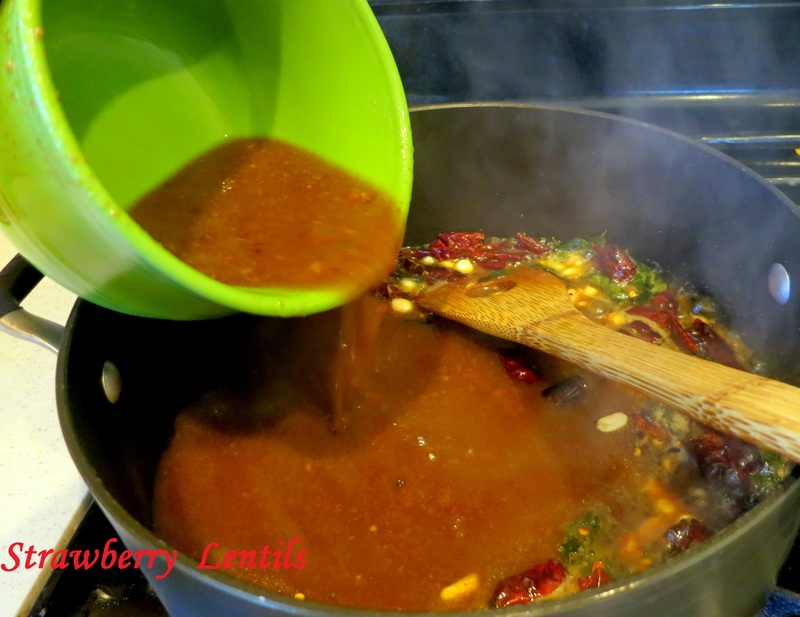 In a sauce pan, heat 2 tsp. 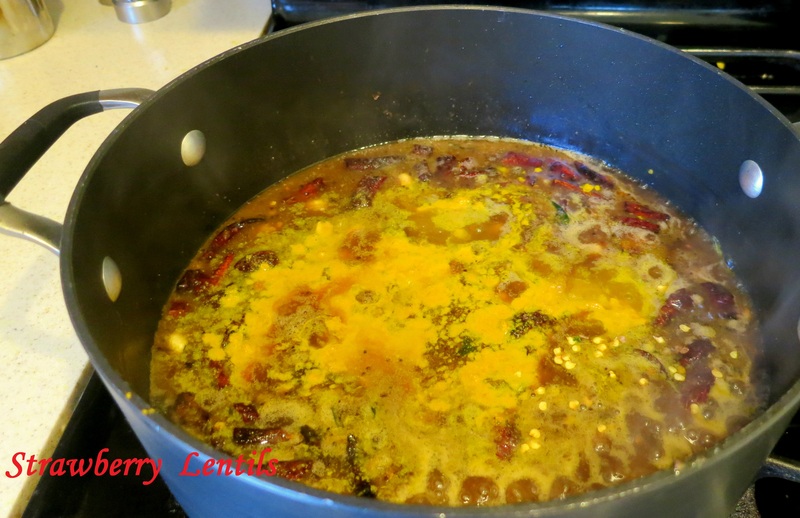 of oil and add the tomatoes. 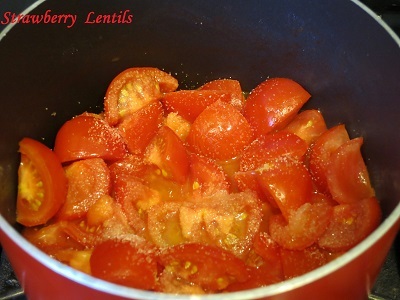 After a quick saute, sprinkle some salt to sweat the tomatoes. 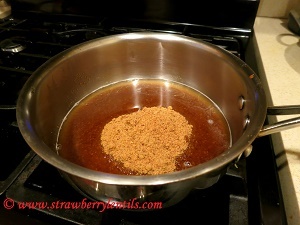 Cover with lid and cook for a few minutes. Tomatoes will give out their juice. Turn off the heat and let it cool down for a couple of minutes. 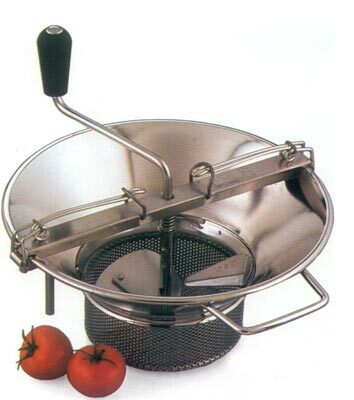 This is a tomato mill/tomato grinder. My grandma used a similar one. (This is bringing back so many memories, as it was my job to use the mill to grind tomatoes 🙂 ). If you don’t have one, no worries. I don’t have one either. 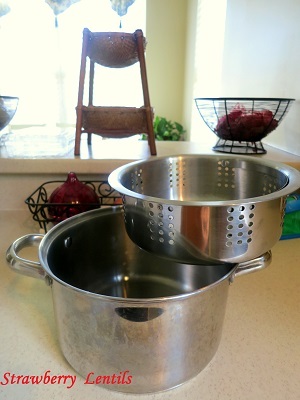 I just use my steamer basket and pot. 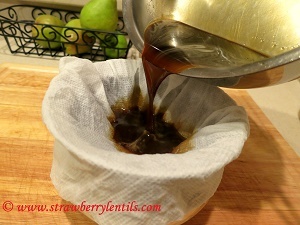 Any strainer and pot combination should work fine. 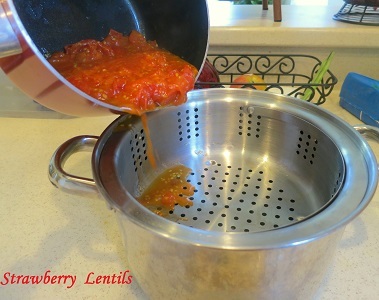 Pour the boiled tomatoes into the steam basket. 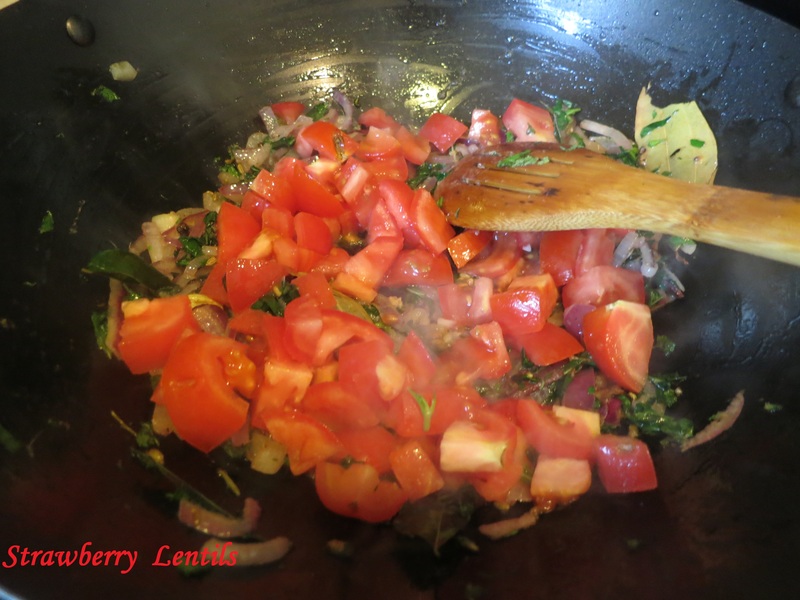 Now use a wooden spoon to stir the tomatoes around while mashing them lightly at the same time. 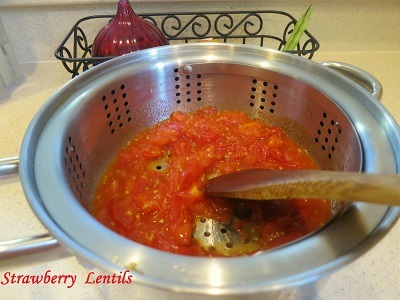 Add little water to the tomatoes and repeat the process, until you are left with just the skin on the steam basket, and the juice in the pot. And here is the tomato awesomeness 🙂 Ok, now for some easier alternatives. 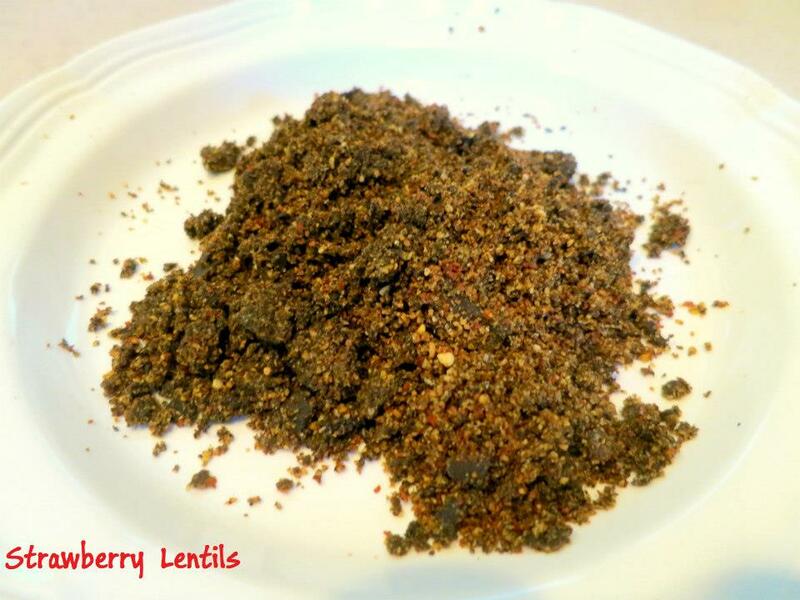 You can grind the boiled tomatoes in a blender and filter out the seeds and skin. (I don’t like that the blenders make it foamy.) 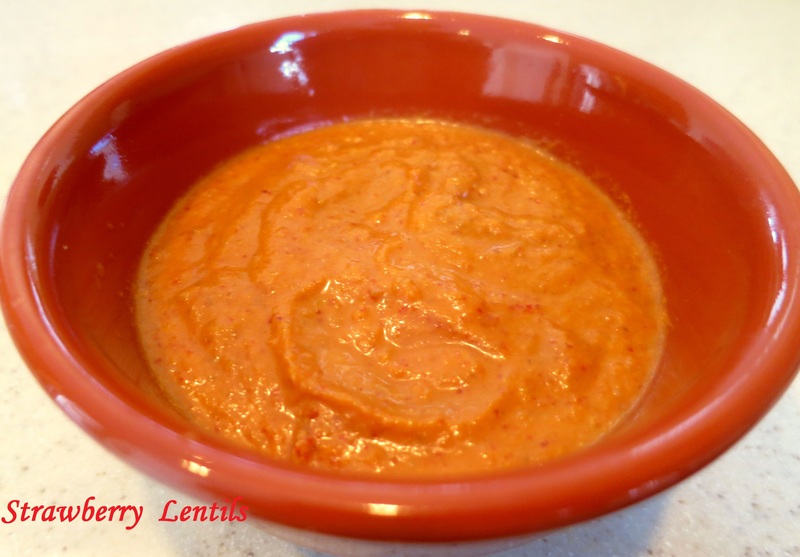 Or, the easiest option of all, dilute canned tomato paste with water. 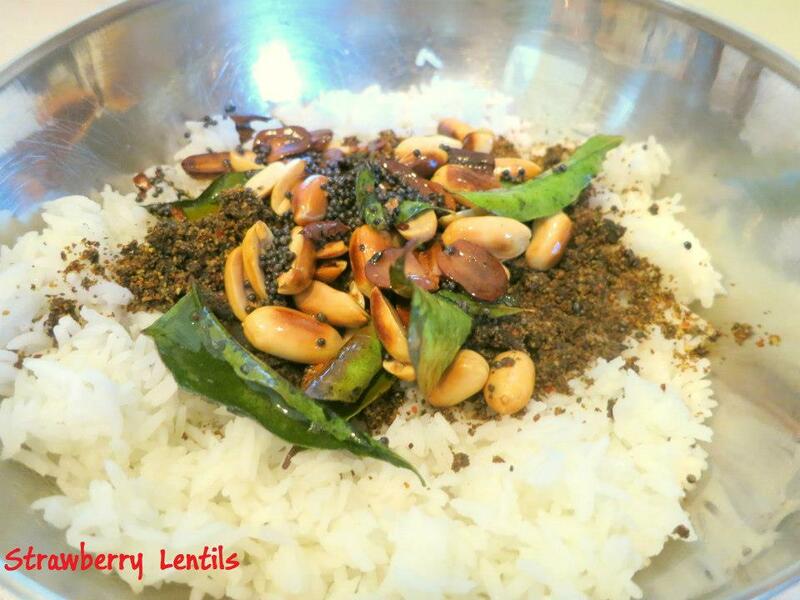 But each method slightly alters the taste and texture of the pulav. 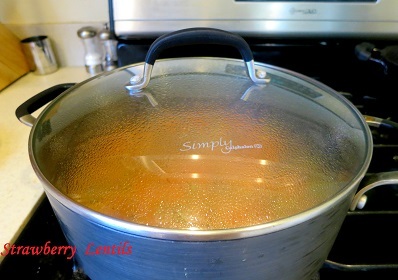 By the way, do we have to be so finicky about cooking in tomato water ? 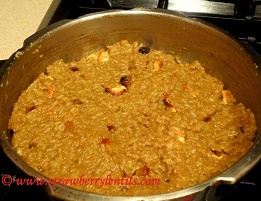 Why not just saute the tomatoes and add the rice ? 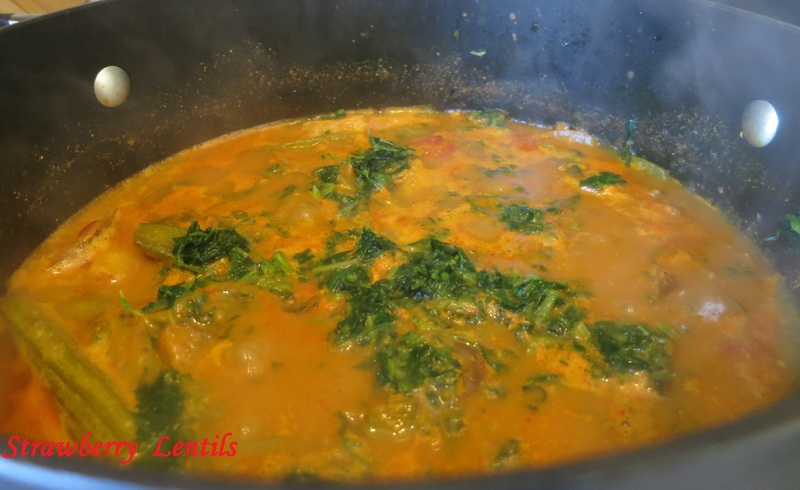 The answer is , cooking in tomato water adds a lightness and a subtle tomato flavor to the pulav which you won’t get in cooking with tomatoes as such. 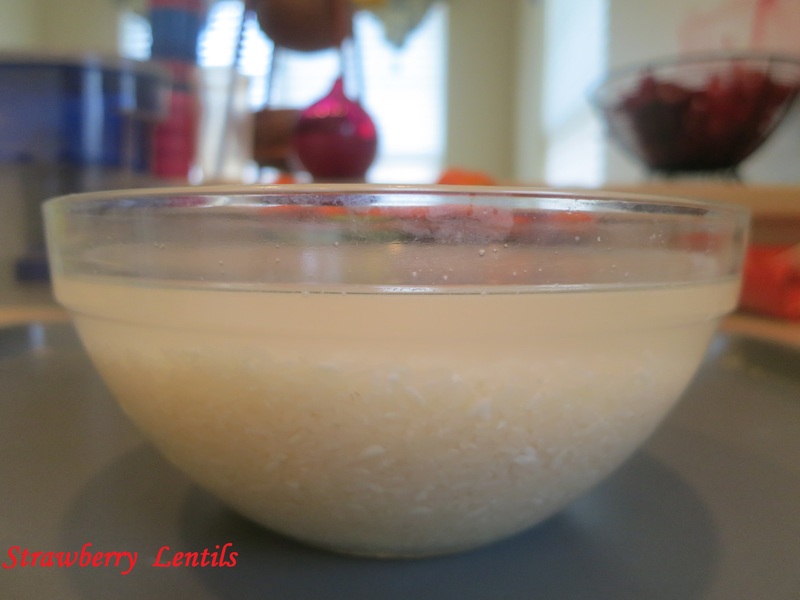 The measure is 1 cup of rice : a little less than 2 cups of tomato water. As I am cooking 2 cups of rice today, I will need about 3.75 cups of tomato water. 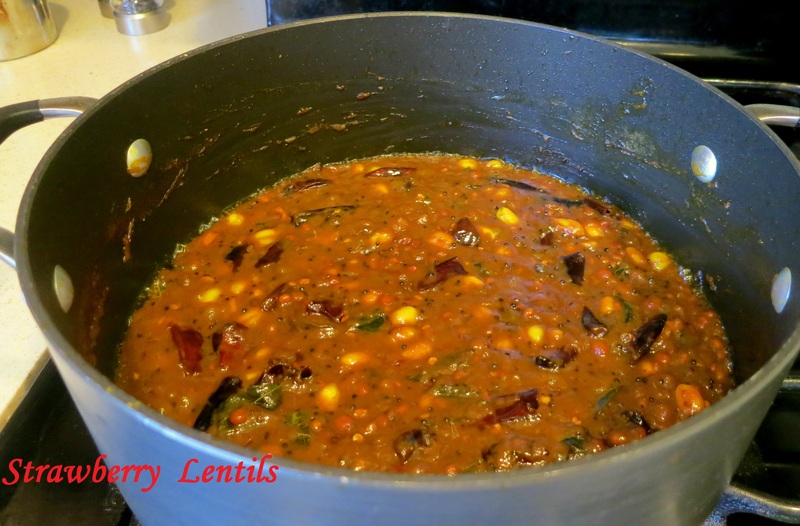 Now that the tomato water is ready, we can get things ready for the pulav. 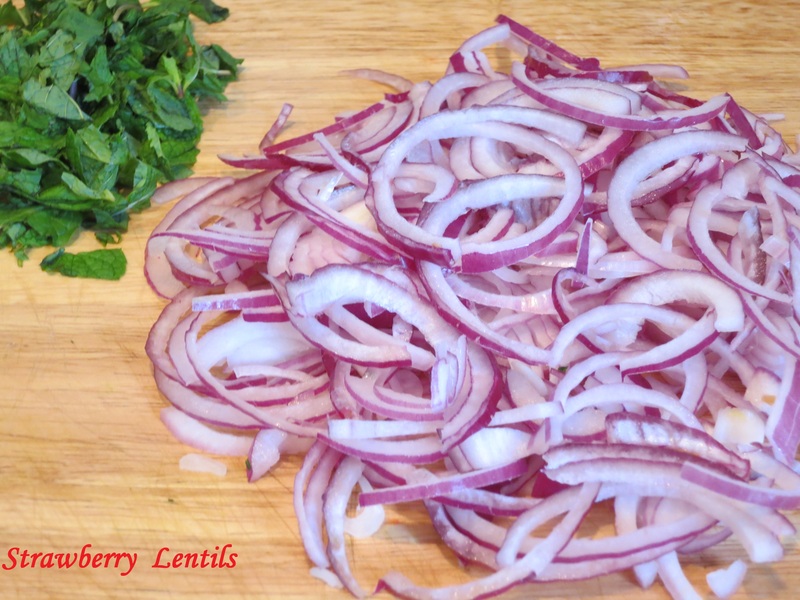 You will need 1 medium onion sliced thin. 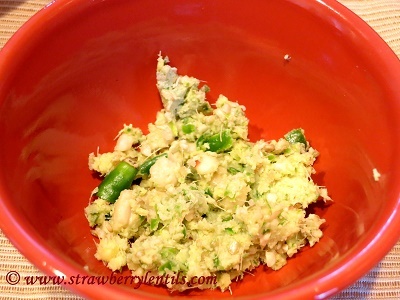 Peas is optional, but I just like to add them for protein. Also mint it optional, you can use cilantro instead. Also slit 1 green chilli. 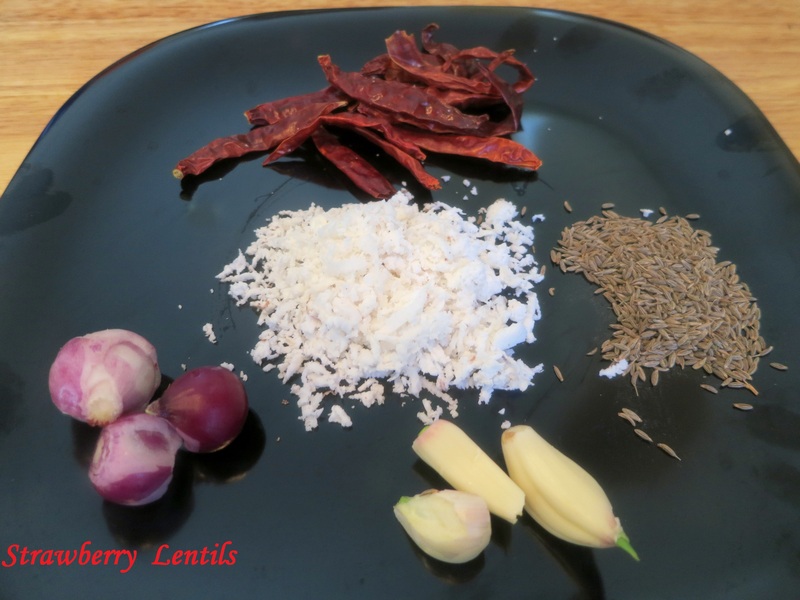 These are the spices needed (in the recommended quantity for 2 cups of rice). 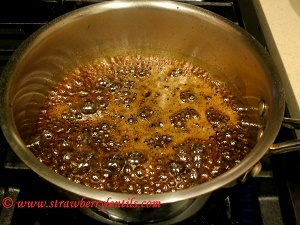 Heat 1 tbsp of butter and 2 tbsp of oil a pot and fry the whole spices. 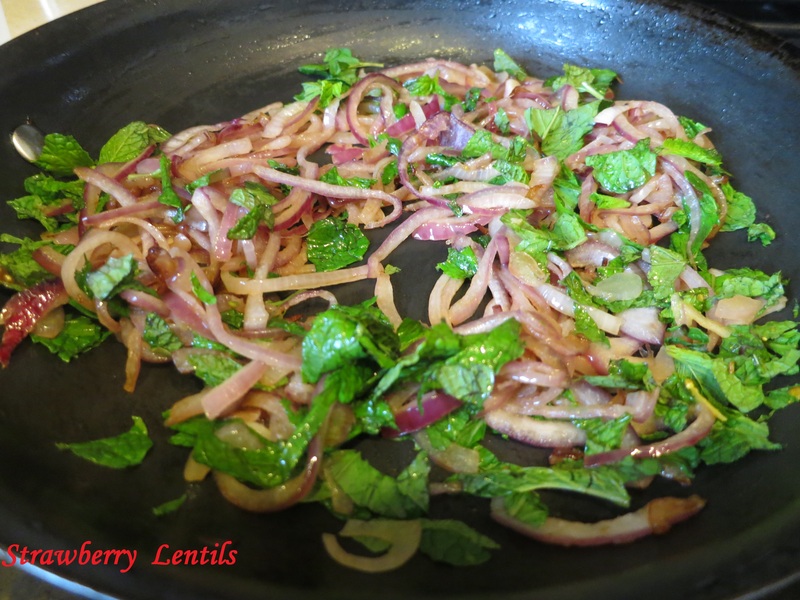 Saute the onions and mint. 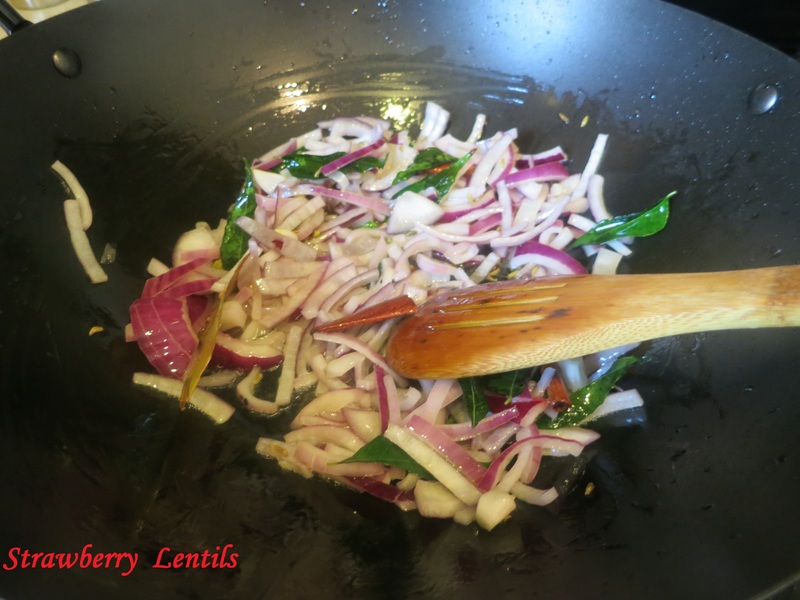 After the onions become translucent, add 1 tbsp of ginger garlic paste. 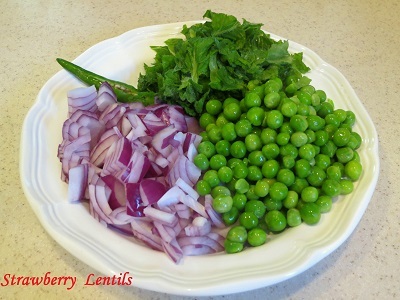 After the raw smell of ginger, garlic paste goes away add the green peas. 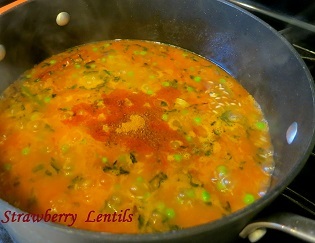 Add the tomato water. 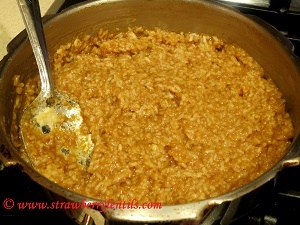 (2 cups of rice : 3.75 cups of tomato water). 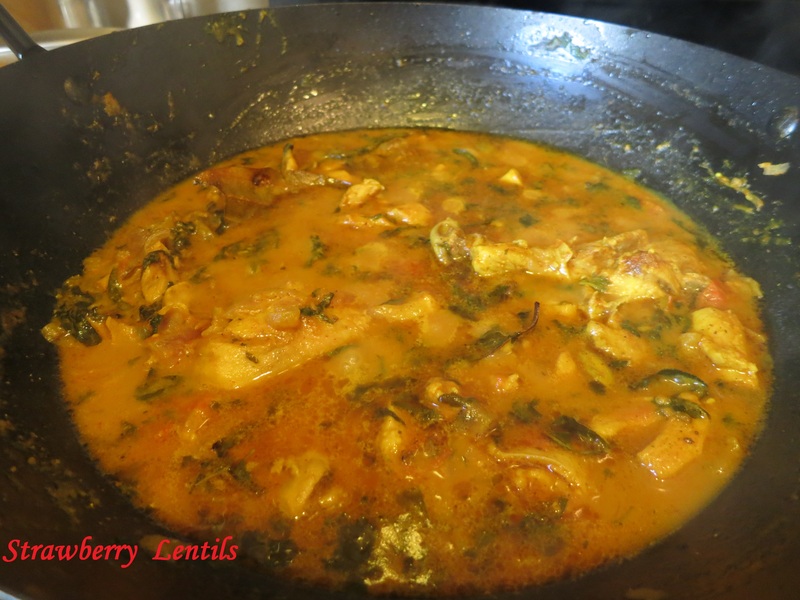 Add 1 tsp of red chilli powder and 1/2 tsp of garam masala. 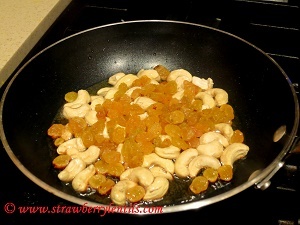 You can add turmeric powder also, it will make the color orangish. 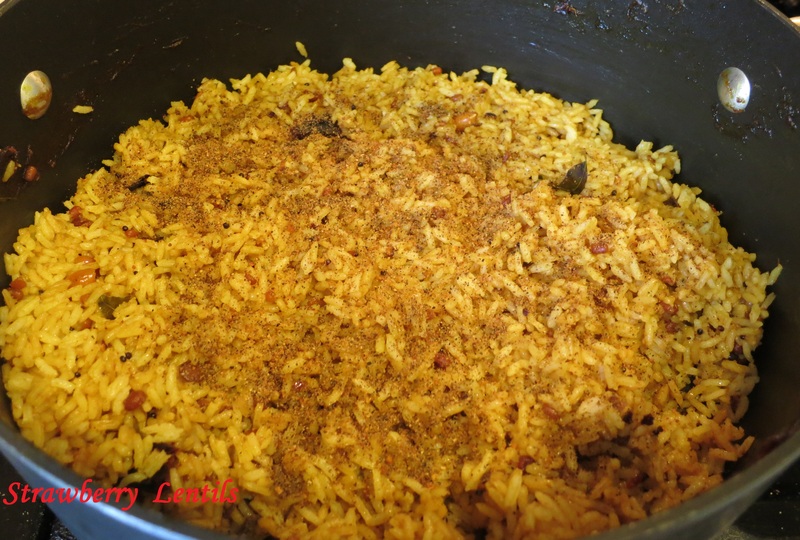 I like the natural color of tomatoes, so I don’t add turmeric powder for this pulav. 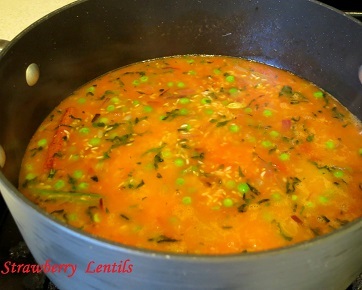 Cover with lid and cook in low heat. Stir once or twice in between. You can also transfer the contents of the pot to an electric rice cooker and complete cooking in the cooker. 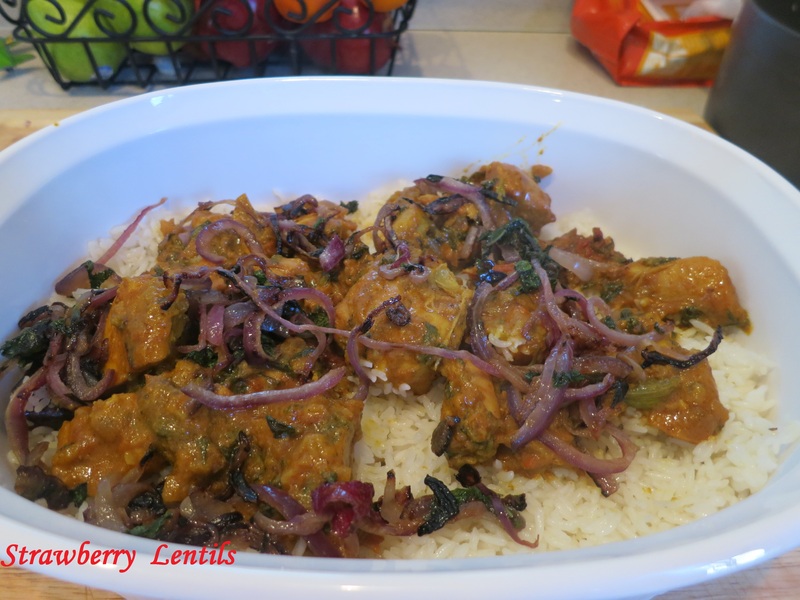 Serve with simple onion raita (onions + yogurt + salt). 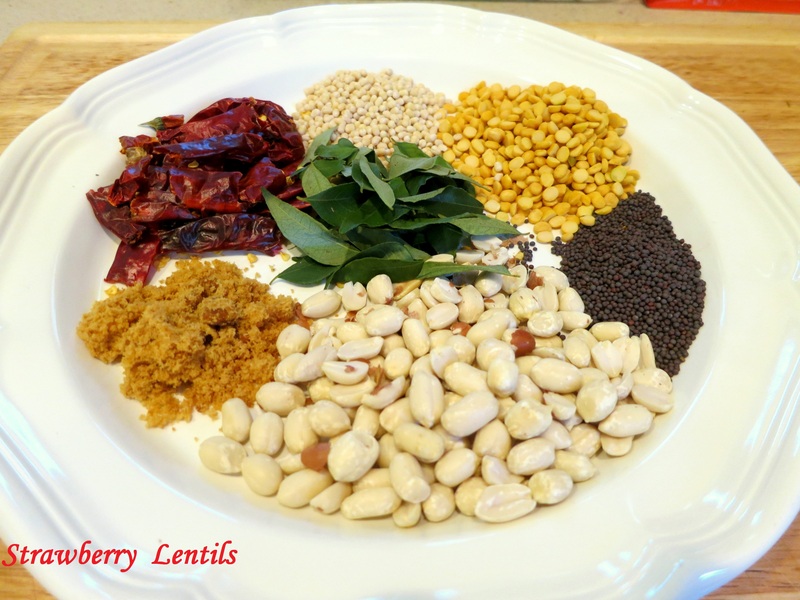 This is my attempt to re-create the “prasadham” I enjoyed in my hometown temple when I was a kid (when temple visits were culinary experiences 🙂 )…..I remember sprinting around the navagrahas so that I can get my share from the priest. 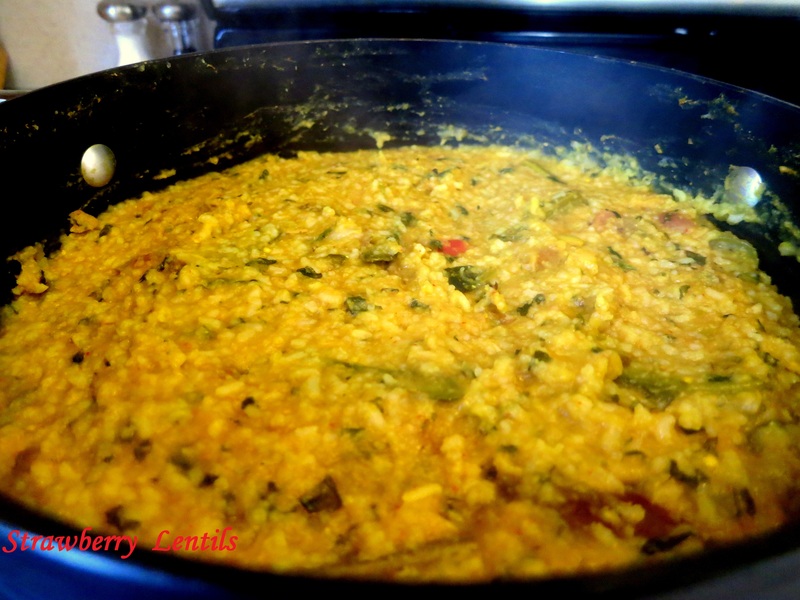 I guess it was the offering for Saturn (Saneeshwararn)…..
Cook 1 cup of rice and allow it cool down. 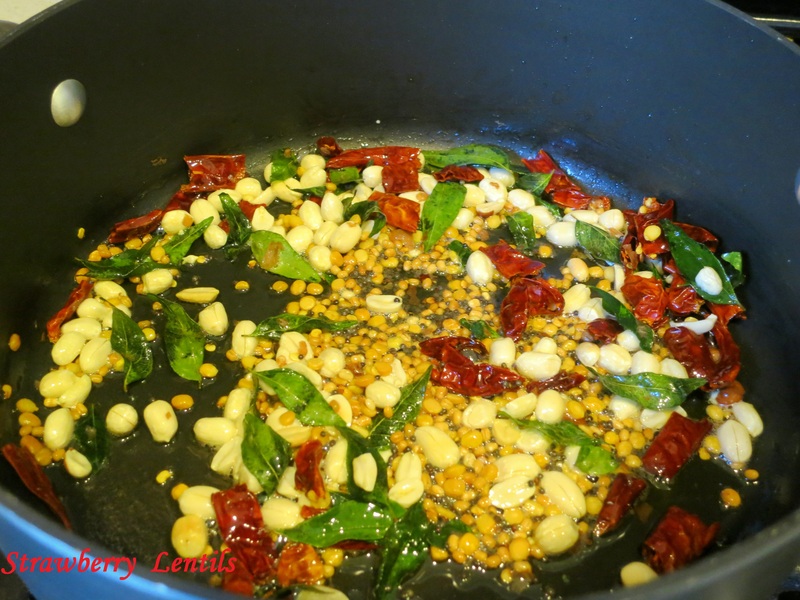 Fry urad dhal, channa dhal, chillies and sesame (in the same order) in a tsp of sesame oil. 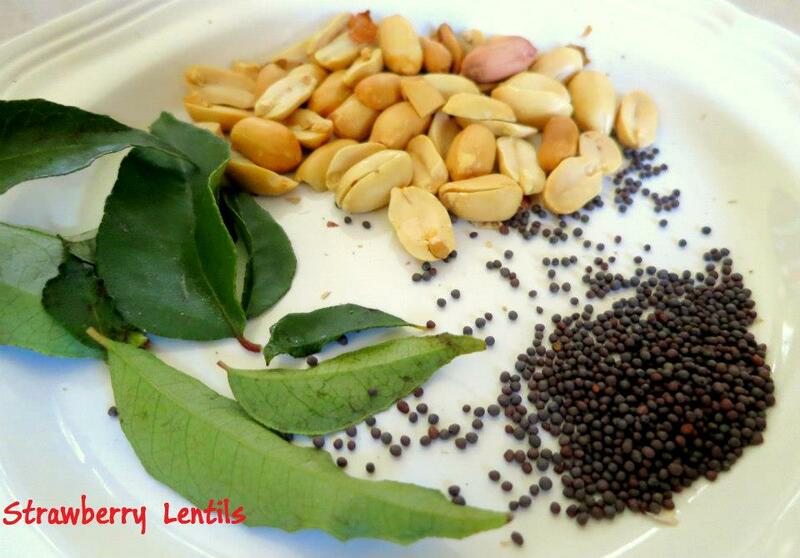 For the final seasoning you need curry leaves, peanuts and mustard seeds. 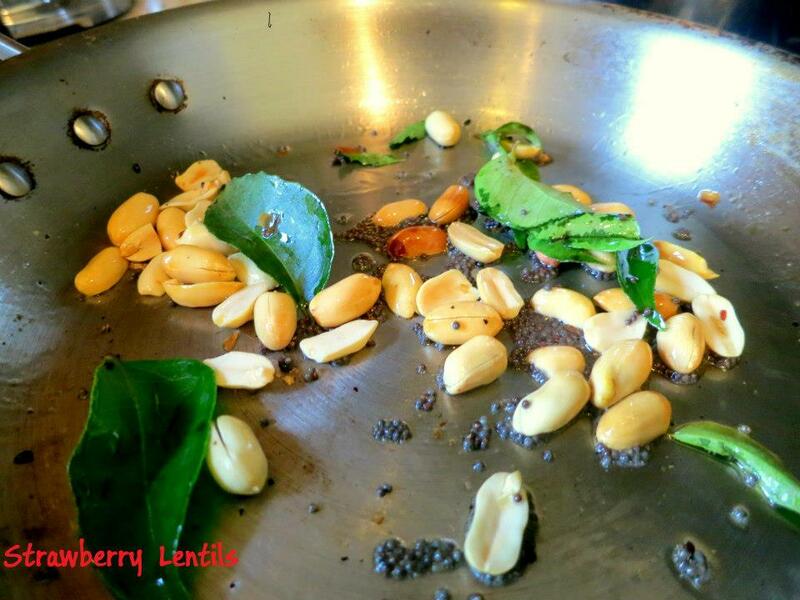 Fry the mustard seeds, curry leaves and peanut in a tsp of sesame oil. 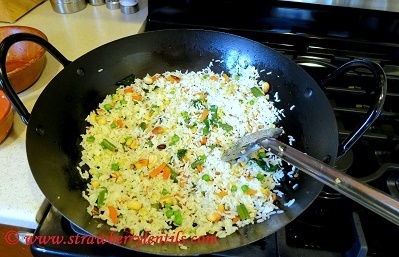 To the cooked rice, add the sesame powder and the fried seasoning. 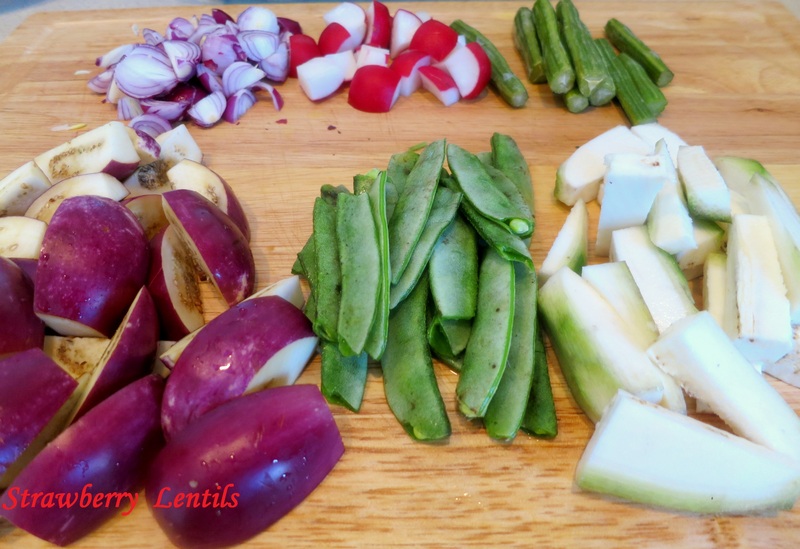 Mix them all together and add salt to taste. 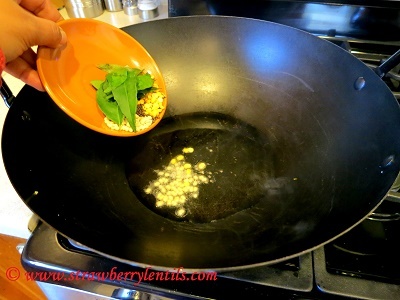 Also drizzle a tsp of sesame oil and mix. 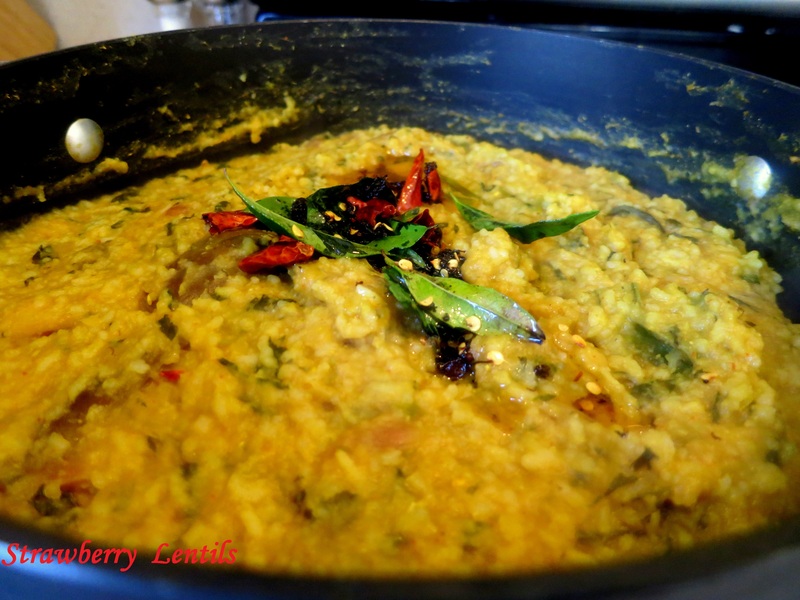 Lemon rice and Tamarind rice are like twins. 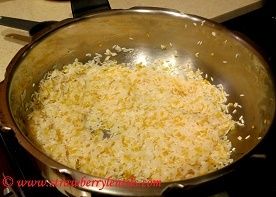 But I’ve seen more people prefer lemon rice, may be its bright color and the fresh lemon scent helps. 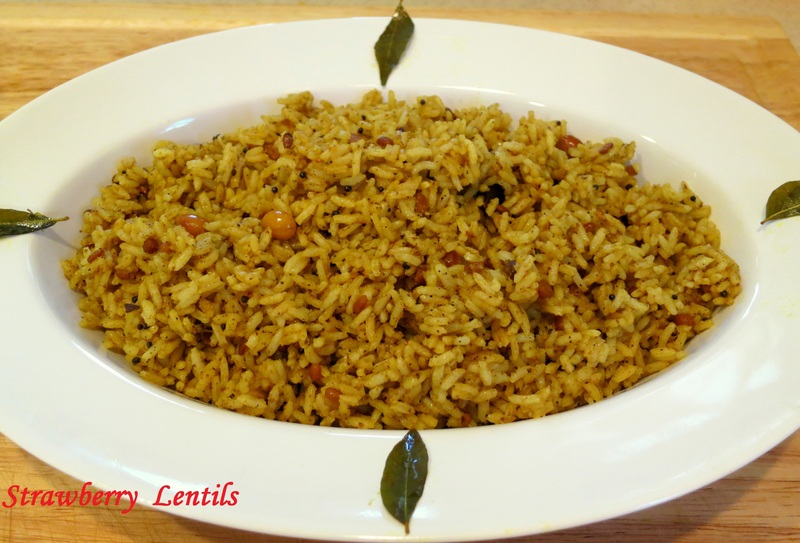 But tamarind rice is a comfort food, often offered in Hindu temples. Its used to be a great travel food, as it tastes good in room temperature and it actually tastes better 3-4 hrs after you make it. 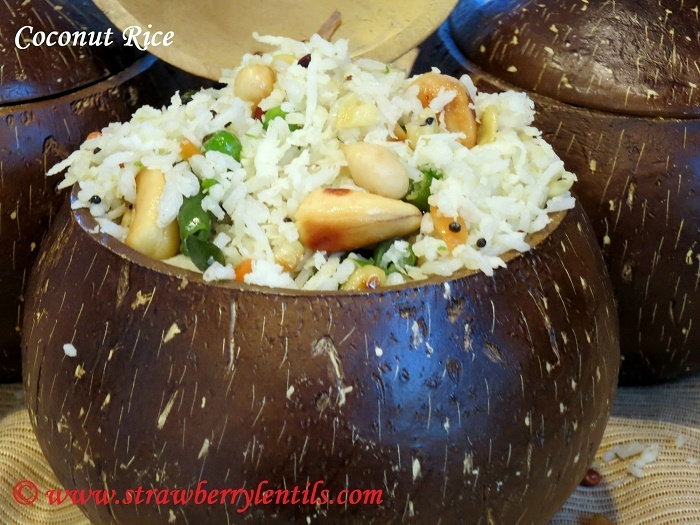 I don’t know if its still popular in this age of pulavs and fried rice, but I think its a rice dish that we just can’t let go. 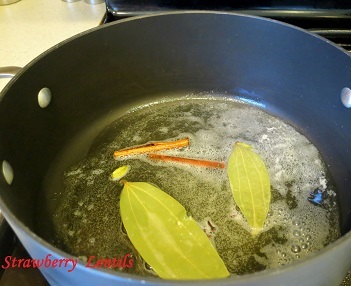 The ingredients in the picture below are to make a flavor enhancing pixie dust that you sprinkle at the very end. 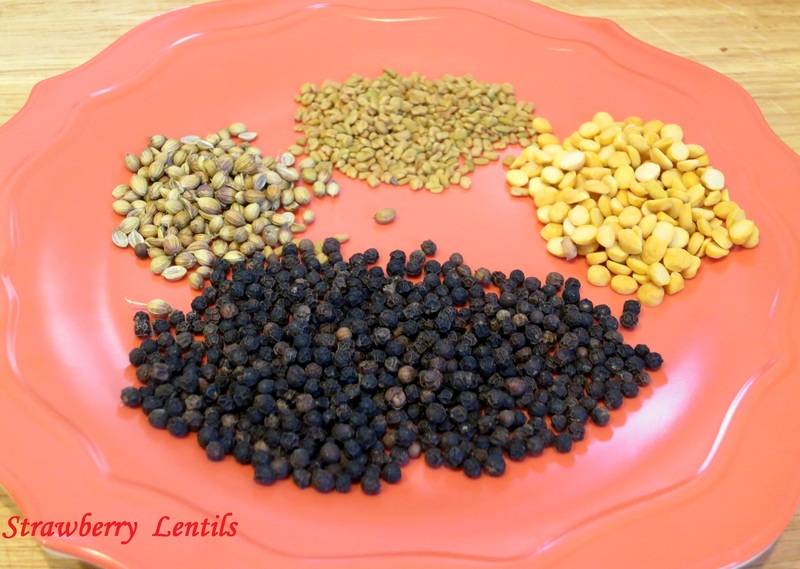 The quantity of black pepper could be alarming, but you need only 1 tsp of this powder for 1 cup of rice. 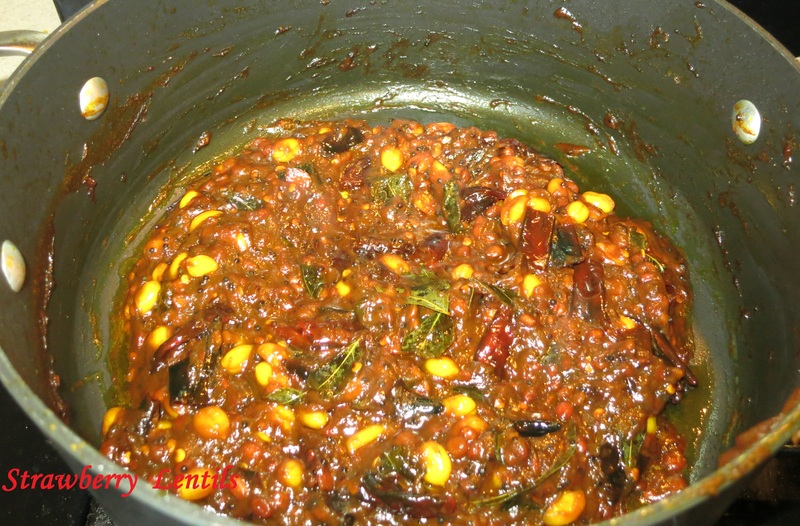 If you are still not a fan of heat, reduce the black pepper and increase channa dhal and coriander seeds. 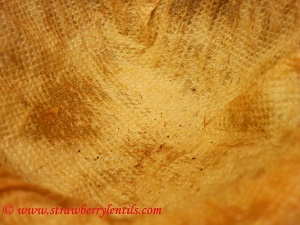 Be careful with fenugreek though, more can make the powder bitter. 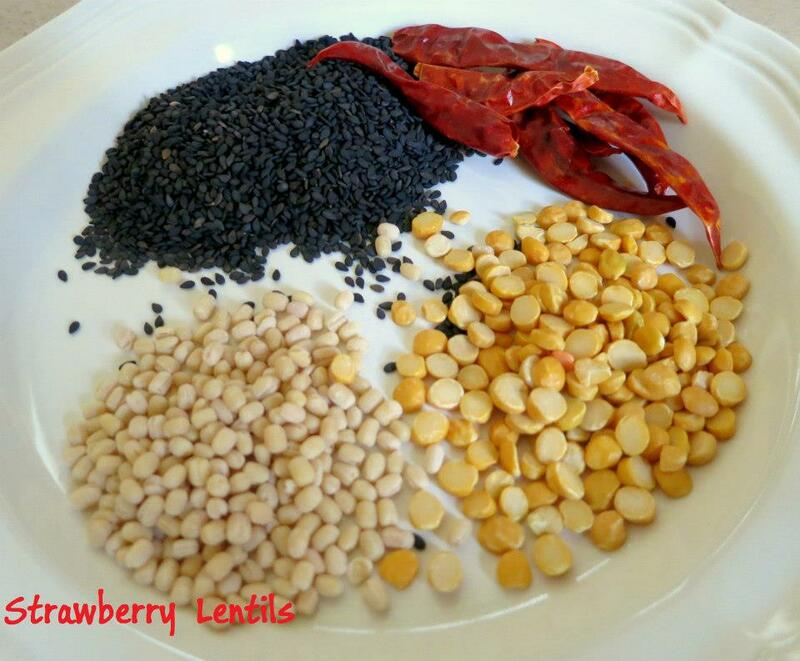 This powder can also be used in curries like sambar or vegetable sides. 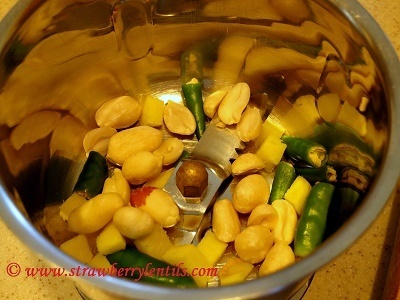 Sprinkle at the very end for a fresh flavor. 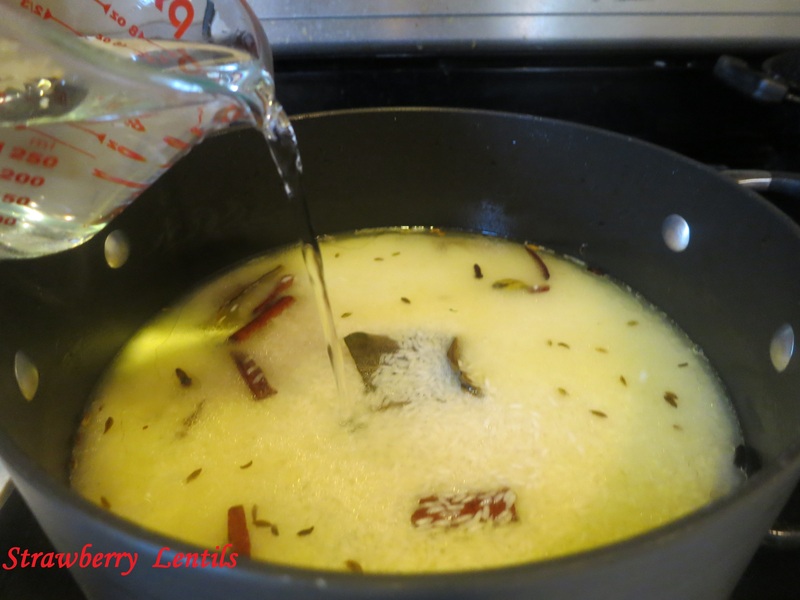 Fry the ingredients in the above photo in 1 tsp of oil. Let them cool down completely. Grind it to a smooth powder. Store in an air-tight container for later use. 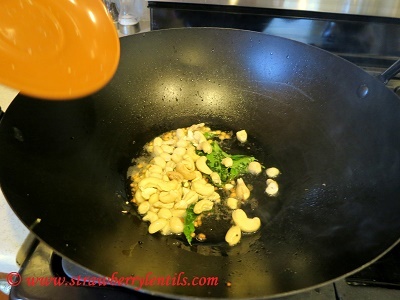 When the peanuts get roasted slightly, add the tamarind juice. 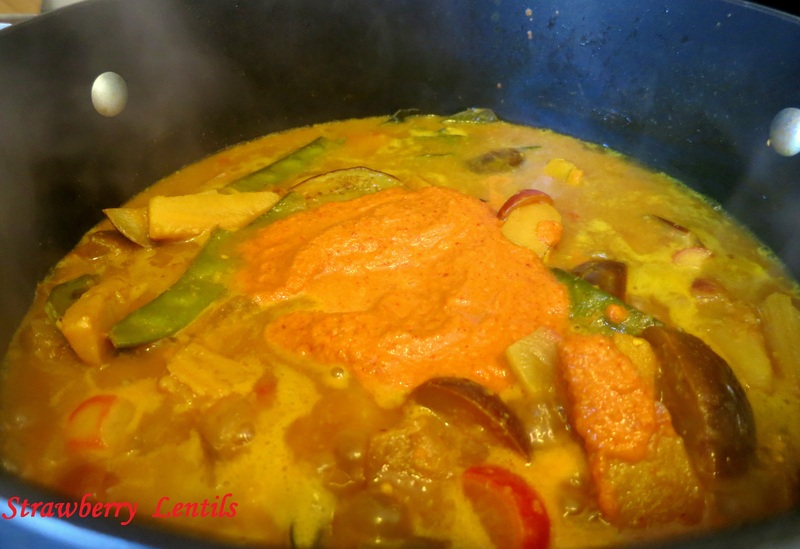 Add turmeric powder, Asafoetida , jaggery and salt. Bring to a good boil. Allow it to reduce and lower the heat. 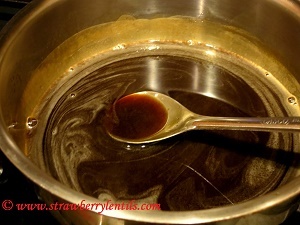 You know its done when the oil separates. 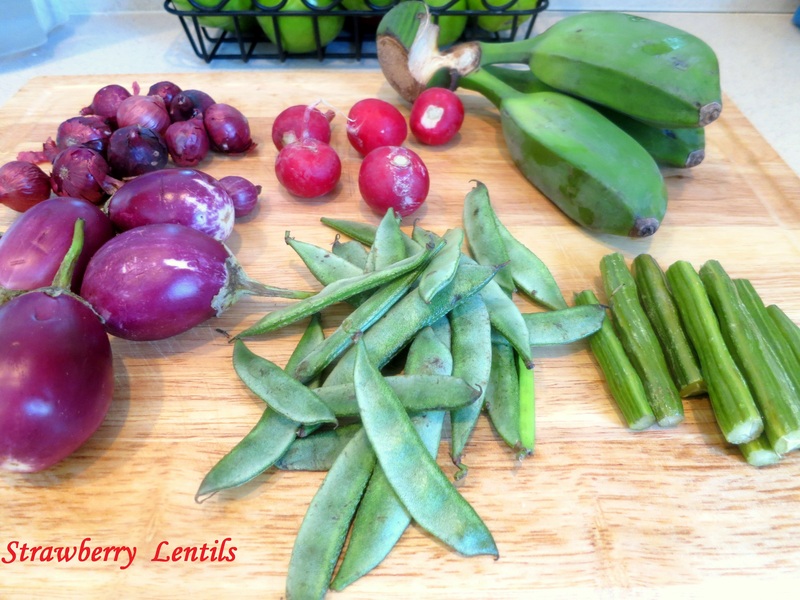 This quantity is good for 10 – 12 cups of rice. 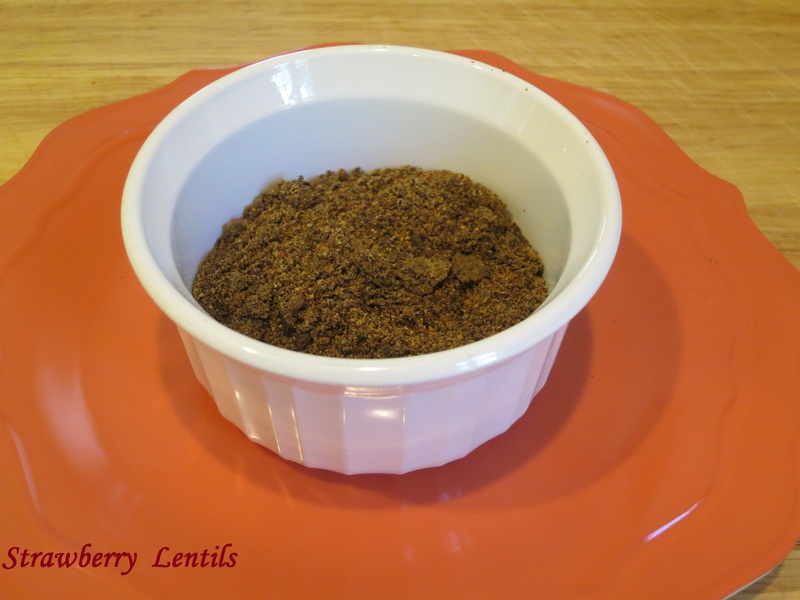 Allow it to cool completely and store it an air-tight container. Doesn’t have to be refrigerated. 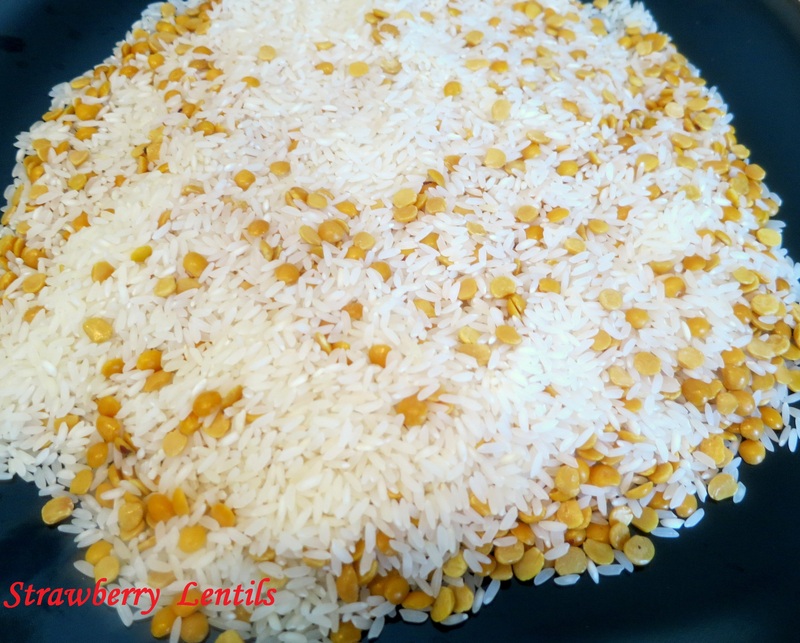 Cook 1 cup of rice and mix with 1 tbsp. of the prepared wet mix. 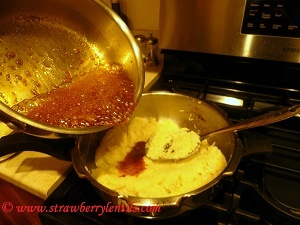 Finally sprinkle 1 tsp. of the powder and mix well. No matter how many new cuisines we expose ourselves to and how many new tastes we get introduced to, some foods scream ” Home”, “Warm” and “Comfort”. This is one such rice. Enjoy ! 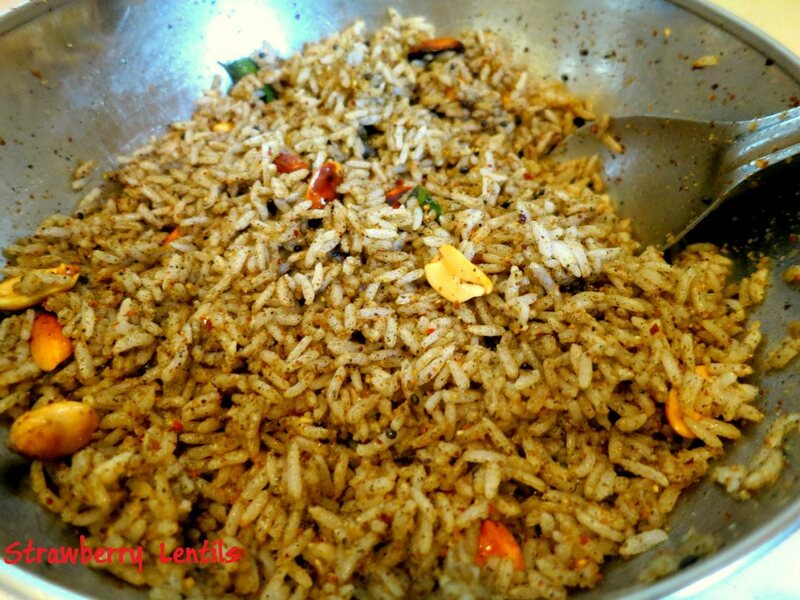 There are more than hundred ways to cook biriyani. This is just one of them. 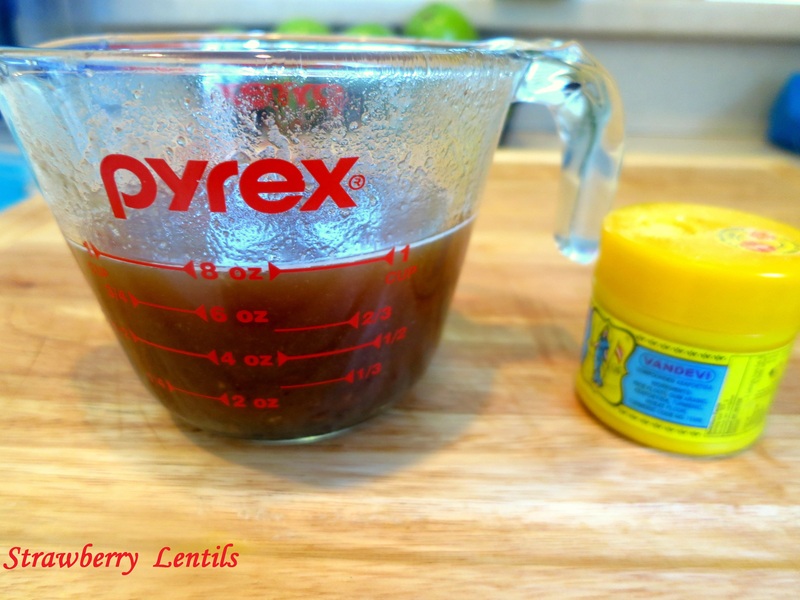 I have combined various steps and tips from many recipes I have tried over the years to simplify the recipe. 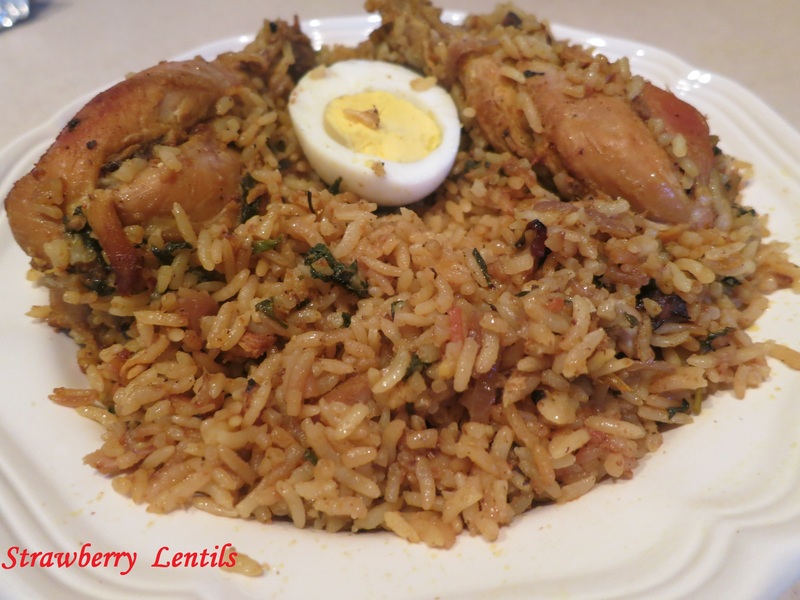 This is a well tested , fool-proof recipe that guarantees yummy biriyani with authentic taste, flavor, color and texture. 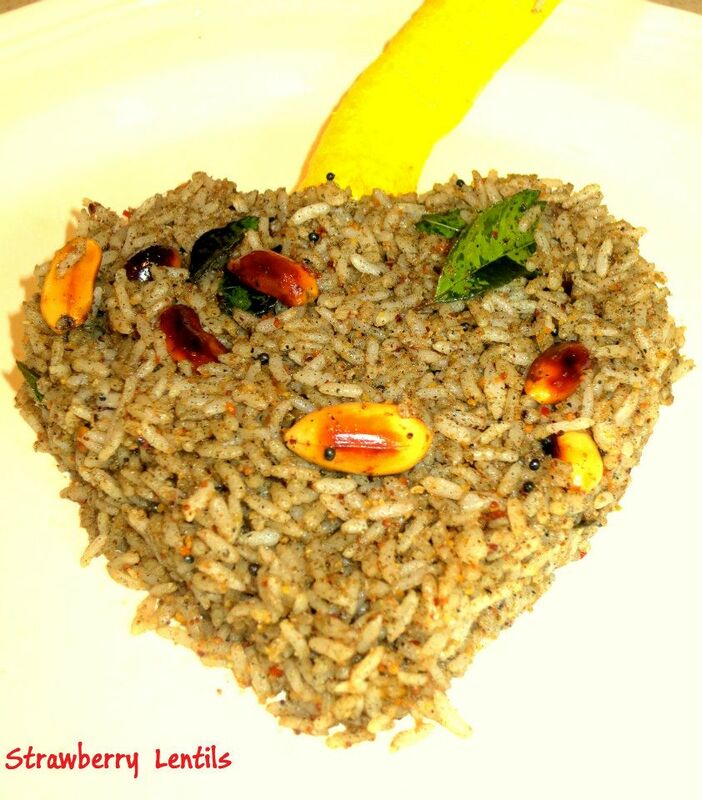 There are usually three layers in Dhum Biriyani. First, cook the rice. 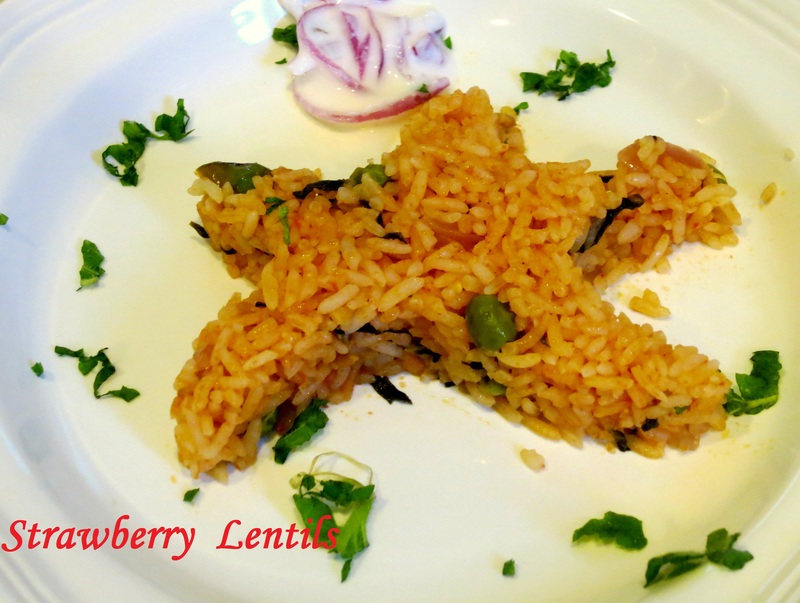 I do not prefer Basmati rice for biriyani. 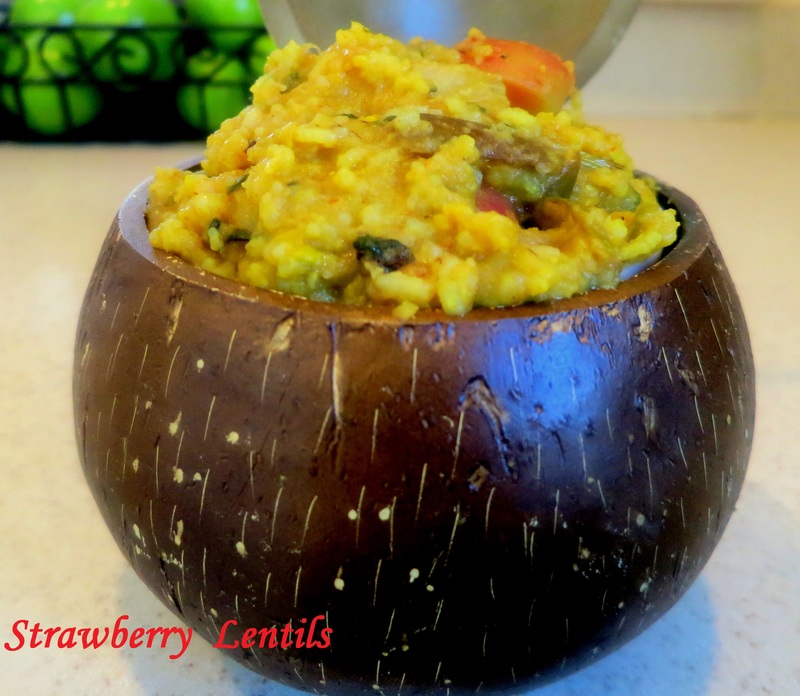 The best option is to use biriyani rice(kichadi samba) or Jeeraga samba. 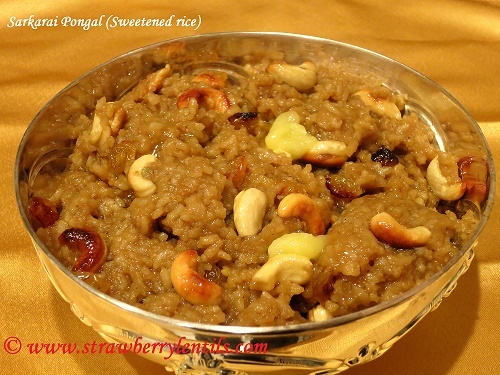 If not, regular raw ponni rice can also be used. 2. 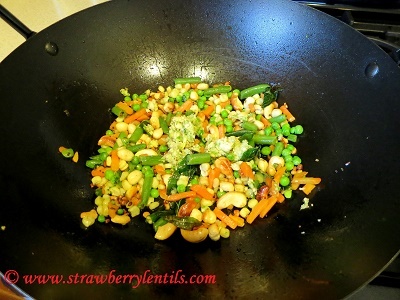 In a pan, heat up 2 tbsp. of ghee and 2 spoons of oil. 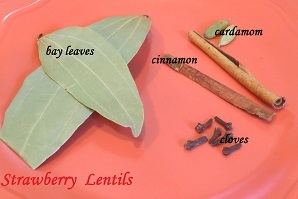 Fry Bay leaves, Cinnamon, Cloves, Cardamom and Fennel. 3. 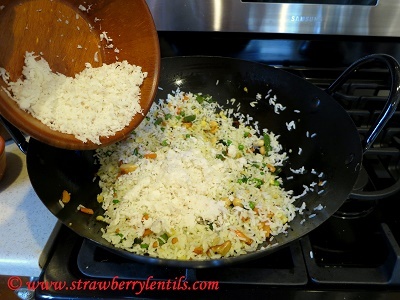 Stir in the soaked rice and mix well so that each grain is coated with oil. 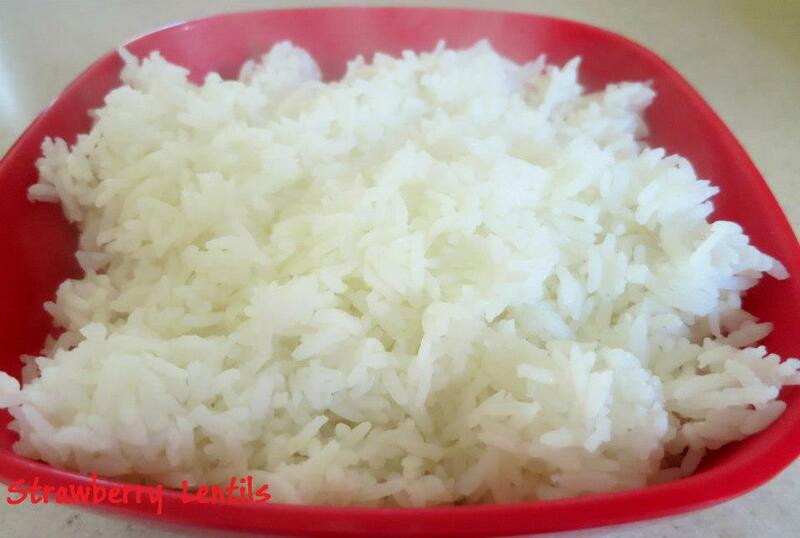 4.Usually I use 2 cups of water for 1 cup of rice for regular cooking. But for biriyani I only use 1.5 cups of water for 1 cup of rice. 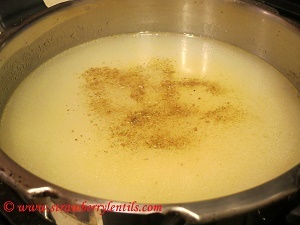 (You can use coconut milk or chicken stock instead of water). Add salt , cover and cook. 5. Rice is cooked al-dente. (It takes about 10 -13 mins). 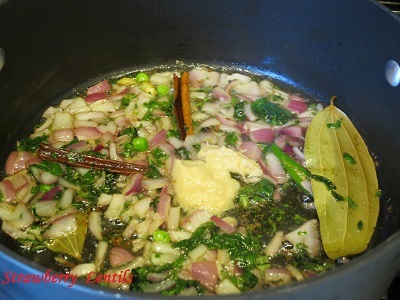 When we cook in dhum later rice will be cooked thoroughly. 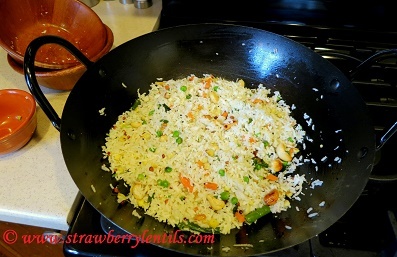 This way we can make sure, the rice doesn’t get mushy and the grains stay separate at the end. 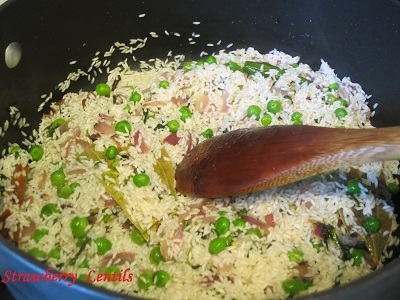 So the first part, preparing the rice is done. 6. 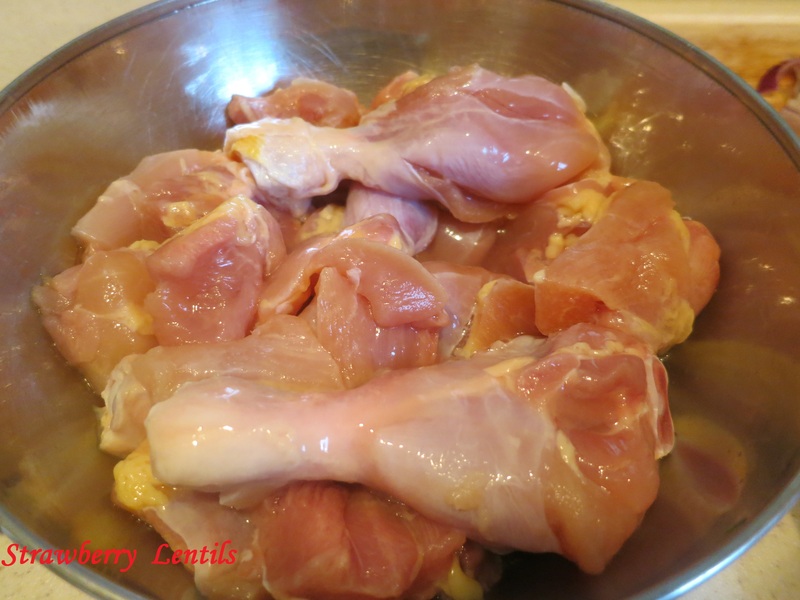 Now to make the meat gravy : Cut and clean chicken pieces. 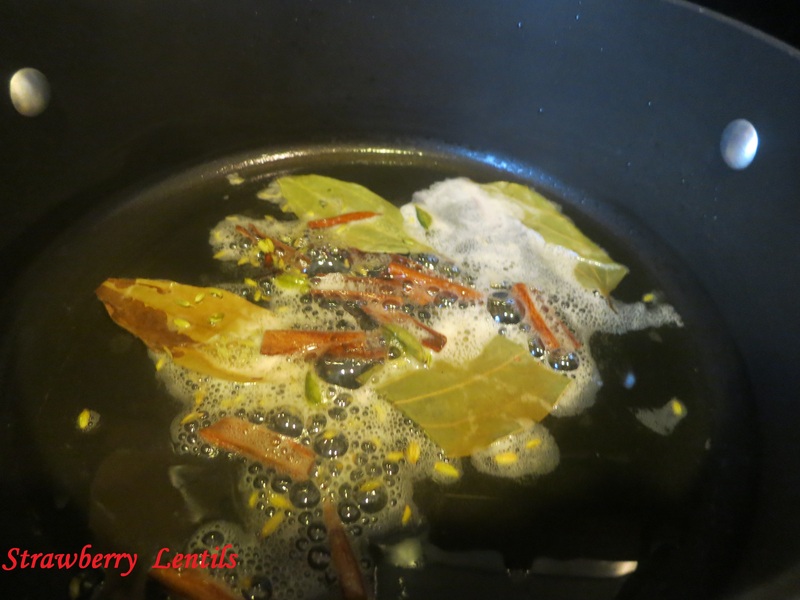 Bay leaves, Cardamom, Cinnamon, Cloves and Fennel. 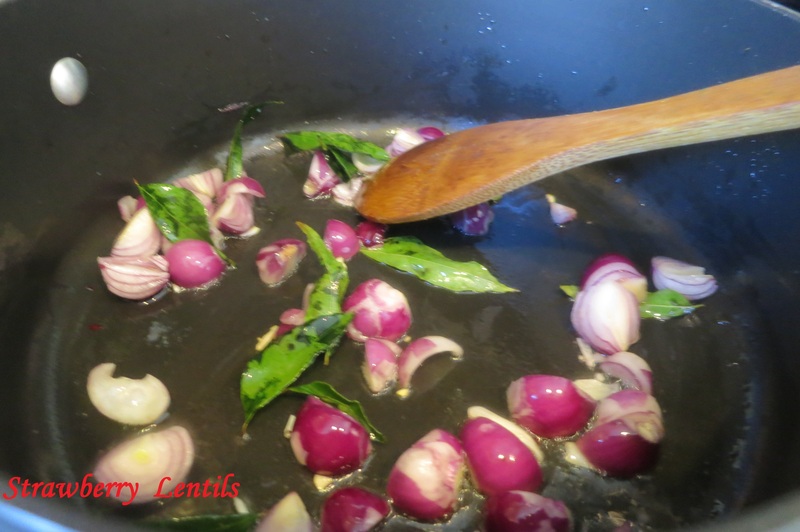 Saute onions, green chillies, curry leaves and 2 tbsp. 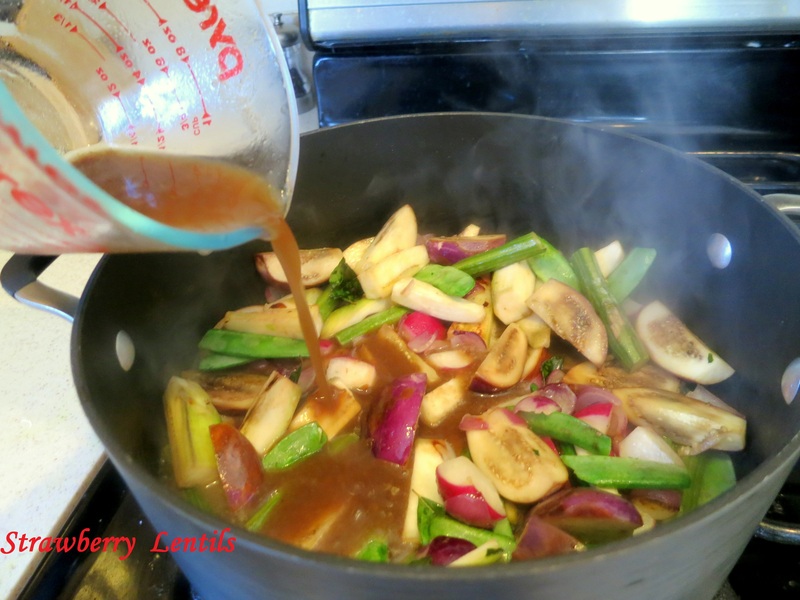 of ginger garlic paste. 9. Saute mint and add the tomatoes. 10. 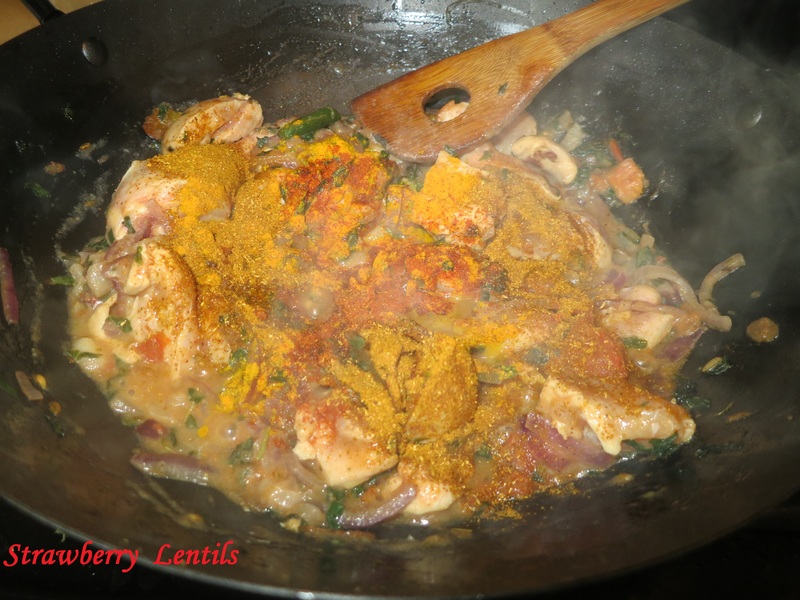 When tomatoes soften , add chicken. 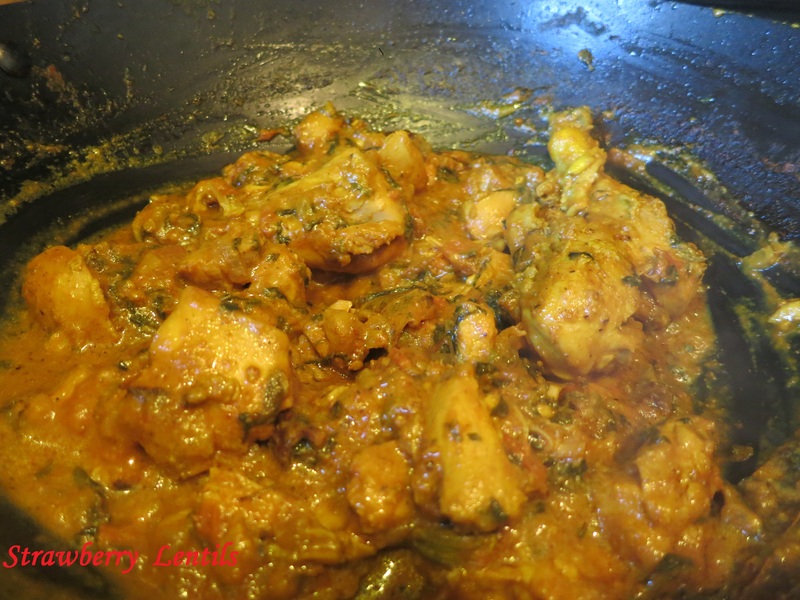 When chicken begins to change color, add turmeric, red chilli powder, coriander powder, garam masala.I would add very little coriander powder. 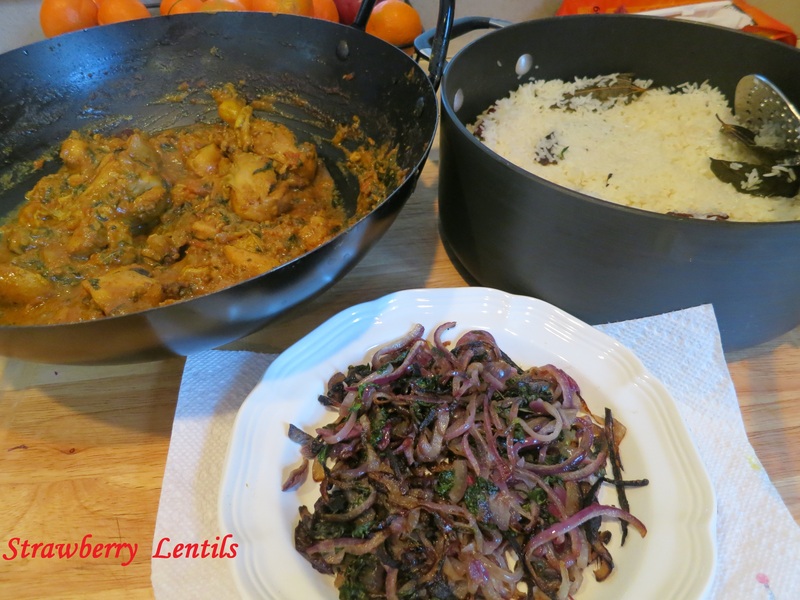 If you have a good chicken curry masala, you can add that too. 11. 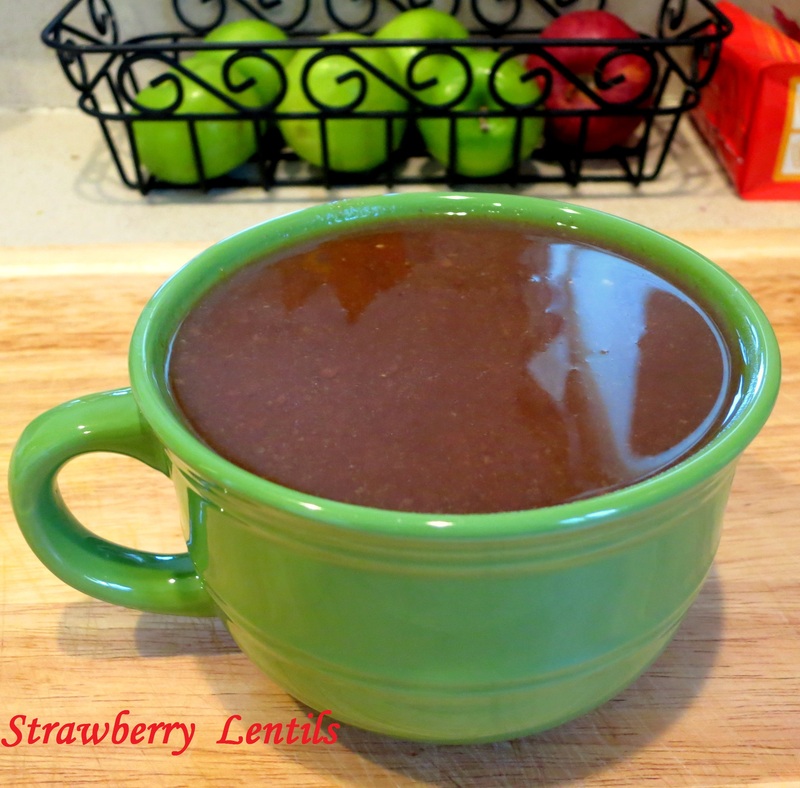 Add a cup of plain yogurt. Add salt. 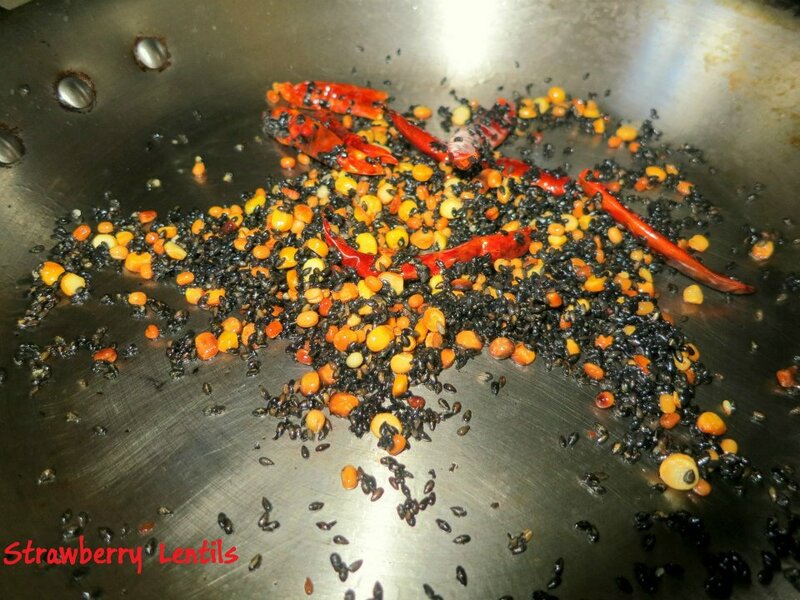 Taste the curry and add more chilli powder or salt as needed. 12. Cook until you get a thick gravy. Chicken should not be overdone. 14. 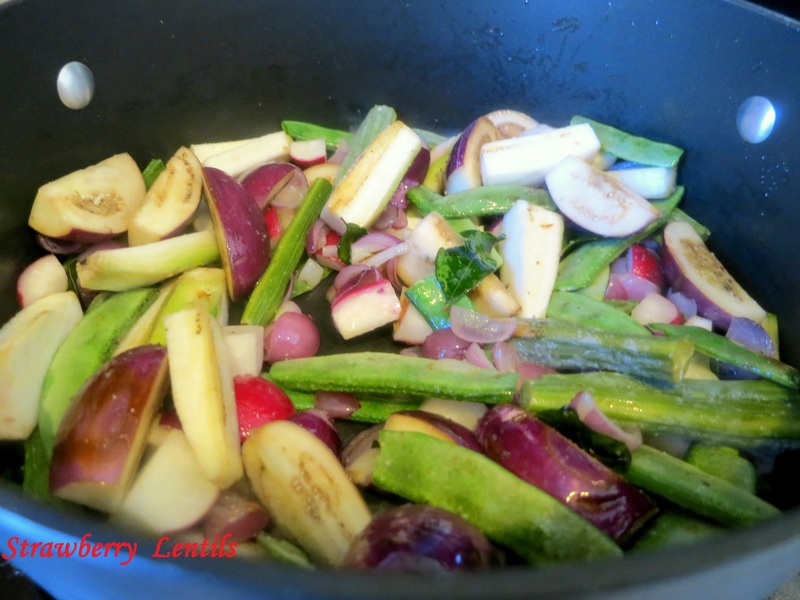 In a pan, heat up a spoon of oil and sauté the onions. when the onions brown , add the mint. 15. 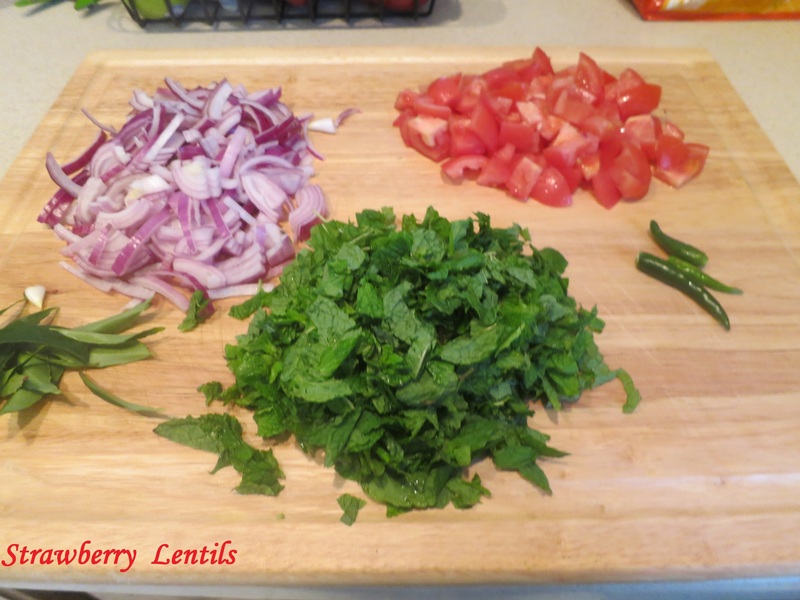 Now we have everything we need to start layering the biriyani. 16. 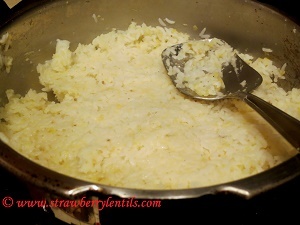 In a baking dish, add a layer of rice. 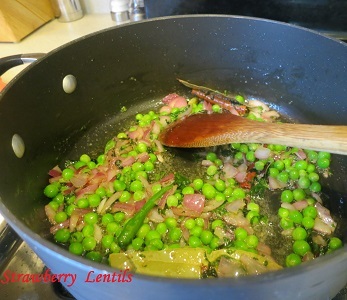 Then add a layer of meat and sprinkle some sautéed onions and mint over them. 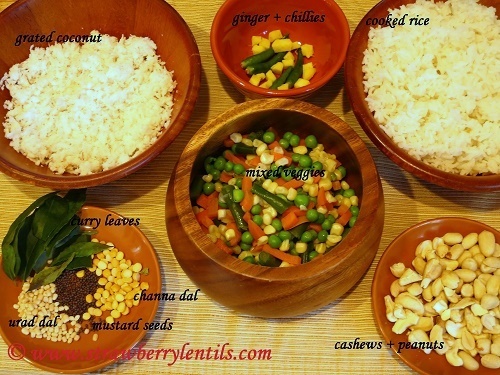 Repeat layering like this until you have used up all your rice, meat and garnish. 17. 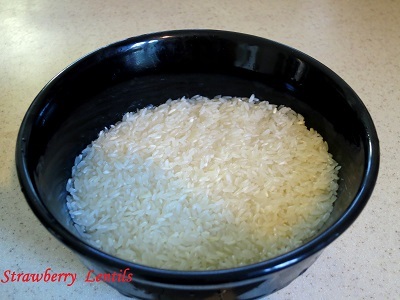 Roughly for 3 cups of rice, you should be able to repeat the layers atleast 3 times. 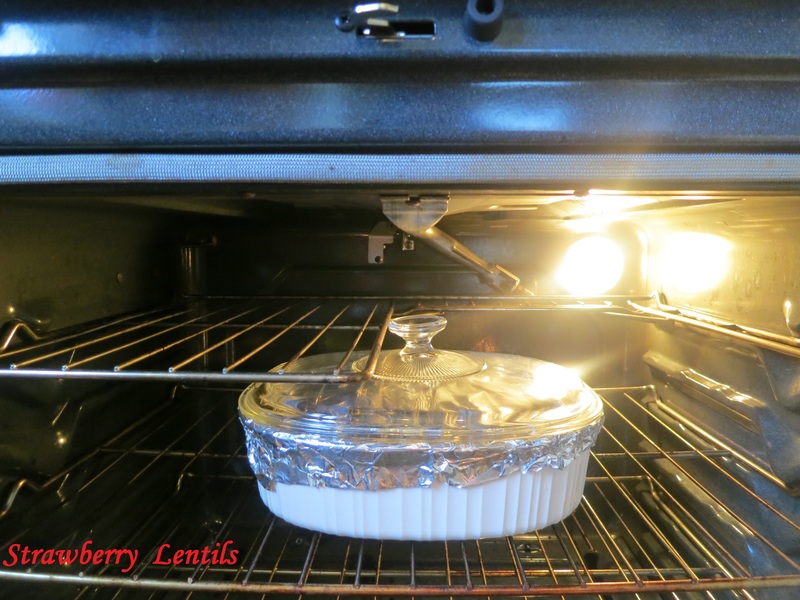 Cover the dish tightly with foil.Place the lid over the foil. Make sure its sealed tight. 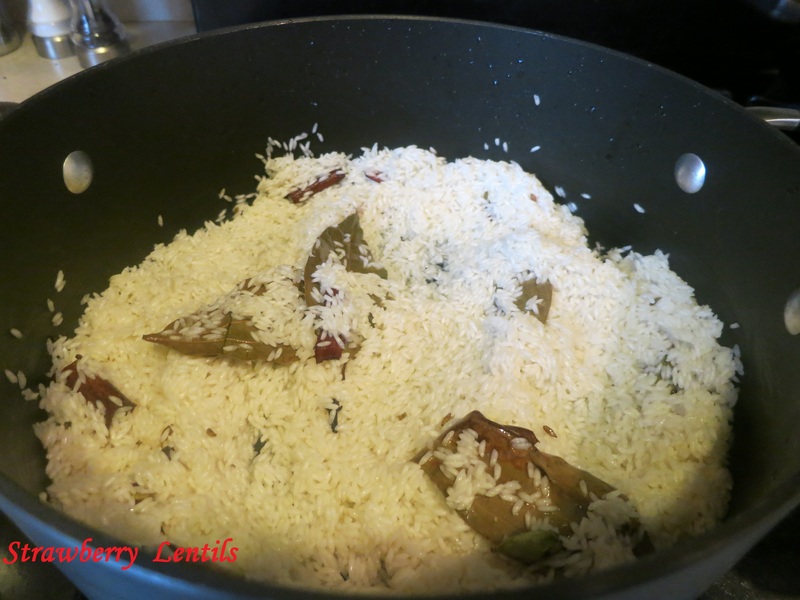 Else, the rice and meat will lose moisture and we will end up with a very dry biriyani. Bake in the oven at 300 degrees F for 1 hour. Mix the layers well to get the traditional look. 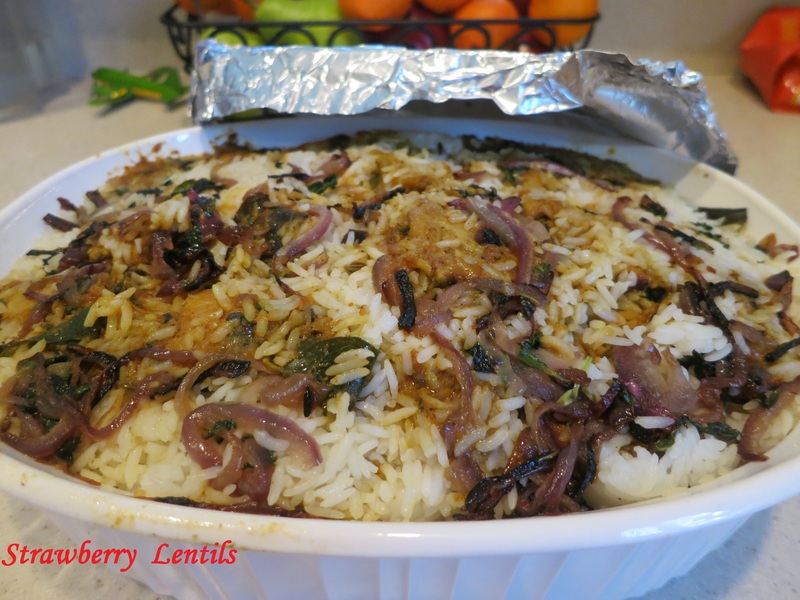 If you do not have an oven, you can layer the biriyani in the electric rice cooker and set it up in “warm” mode (instead of “cook”) for an hour.